In the Bavarian-themed town of Helen, Georgia, I spot the white Can-Am Spyder of Lamar Veatch outside a diner. We’ve come to this quaint tourist haven to ride the region’s best motorcycling roads and rediscover a bit of history. Veatch, a heritage associate with the Georgia WWI Centennial Commission, rides across the peach state documenting all the monuments and plaques honoring those who served in the Great War. Helen lies at the southeastern end of The Gauntlet, a collection of mountain passes at the base of the Blue Ridge Mountains. This motorcycling destination gets its name from the 133-mile loop of roads that resemble the knuckles of the clinched fist. The Gauntlet circles Blairsville, where we intend to visit a stone obelisk honoring World War I veterans. “There’s a national effort to identity and document WWI monuments, memorials, plaques whatever they are because a lot of them have been forgotten about,” Veatch says. He’s cataloged about 130 such monuments in most of Georgia’s 159 counties. He took up the task of documenting and digitizing the memorials for the WWI Centennial Commission after retiring as the state librarian. “I thought it will be fun to ride around, take pictures of them. Some are overnight trips, others day trips, just going out and hitting three or four towns and picking up all these monuments,” he says. His work began with a 1921 state memorial book with photographs and names of Georgians killed in the war, which he’s building into a searchable database. We ride east of Helen to find U.S. 19 and run up to Blood Mountain, where the Appalachian Trial reaches its highest point in Georgia. Passing lanes provide overtaking opportunities along the well-maintained highway. We reach the summit and wave to a group of sport bikes pausing at the top like birds of prey waiting to attack. On the northern descent from Blood Mountain, I spot the Georgia 180 signs and the road I’ve eagerly awaited, Wolf Pen Gap, also known as The Wolf. The westerly route twists across the mountains along a lonely stretch of road with little traffic, tempting to bring out the wolf in every rider. 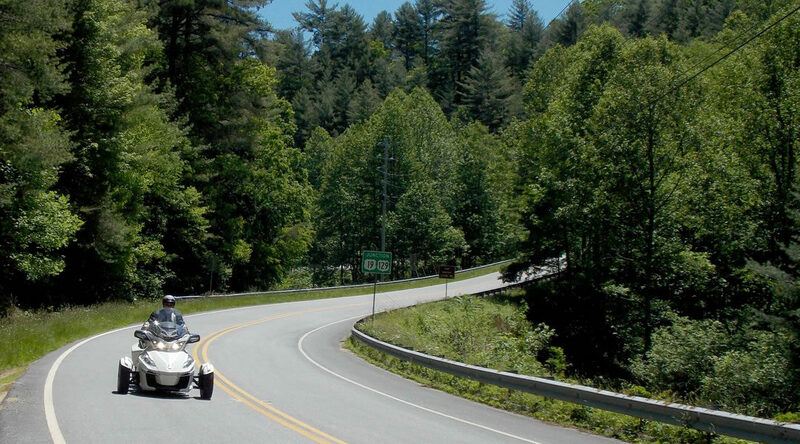 Halfway in its journey to the community of Suches, the road passes Lake Winfield Scott Recreation Area with makes for an excellent spot to enjoy a break by the small mountain lake. At the end of the Wolf, we reach the Two Wheels of Suches motorcycle resort on Highway 60. Each summer, riders from across the Southeast make this creekside lodge their basecamp for exploring the southern Blue Ridge Mountains. The no-frills seasonal resort features a restaurant, cabin rentals and tent camping. Even if you’re just passing through on The Gauntlet, the bright red lodge with its covered porch adorned with rocking chairs makes a great place to relax before hitting the twisties once again. After the highly technical turns along Wolf Pen Gap, The Gauntlet eases its grip on riders along Highway 60. Rolling farmland unfolds before us as the mountains frame the horizon. Veatch is all smiles as his Can-Am carves through the turns. We head toward Blairsville to visit Copperhead Lodge, another motorcycle resort. Located on Nottely Dam Road, the Copperhead Lodge offers casual fine dining, a full-service bar, and live entertainment. Travelers can stay in the main lodge’s guest rooms or rent nearby cabins that feature enclosed motorcycle garages. Road-weary riders can relax in the swimming pool next to a covered stage for concerts and other entertainment. The top of The Gauntlet visits Nottely Lake and Chatuge Lake and connects with the U.S. 76 and the Southern Highroads Trail, a scenic route across Georgia, the Carolinas and Tennessee. Just east of Blairsville, Brasstown Bald can be seen in distance. This highest mountain in Georgia features an observation tower and panoramic views for miles in every direction and is worth the detour. In the center of historic downtown Blairsville, commuters circle around the old courthouse-turned-museum in the busy square. “I’m particularly fond of this stone monument,” Veatch says. Next to the flag pole rises a tower of river rock with an inlaid stone tablet erected in 1930. A carved image of a doughboy’s helmet tops the short list of eight Union County heroes to fall in the war to end all wars. According the WWI Centennial Commission, Georgia hosted more WWI training camps than any other state and sent more than 100,000 men and women to the war effort.